... well, there you go. Central Food recently put a mac and cheese on their menu, one that's a bit more unique than any of the other ones we've tried so far, and different, at least flavor wise, from how we remember Blaine's previous dish at Latah Bistro. The actual mac and cheese is fairly basic: you simply have penne pasta in a cheese sauce, with the addition of breadcrumbs and spinach. Nothing wrong with that, and with a flavorful cheese and well-prepared pasta, the mac and cheese part is very good in its own right. What makes this dish different is the duck. Now, duck in mac and cheese is something a bit out of the ordinary in itself, but as we had expected the duck to be incorporated into the dish, instead of being on top of it... Well, we were surprised. To me it made sense putting the duck breast on top; it's flavorful, apparently house cured, and now you can mix and match the duck and mac and cheese to your own liking. It's not that different from having duck served on top a heap of, say, mashed potatoes. It's just a whole lot more hearty. For some it might be a bit of a letdown not to have the duck mixed in the same way we've seen chicken used countless times. I can understand that. But with a nicely prepared duck like this, I, at least, feel Central Food went the right direction with this. 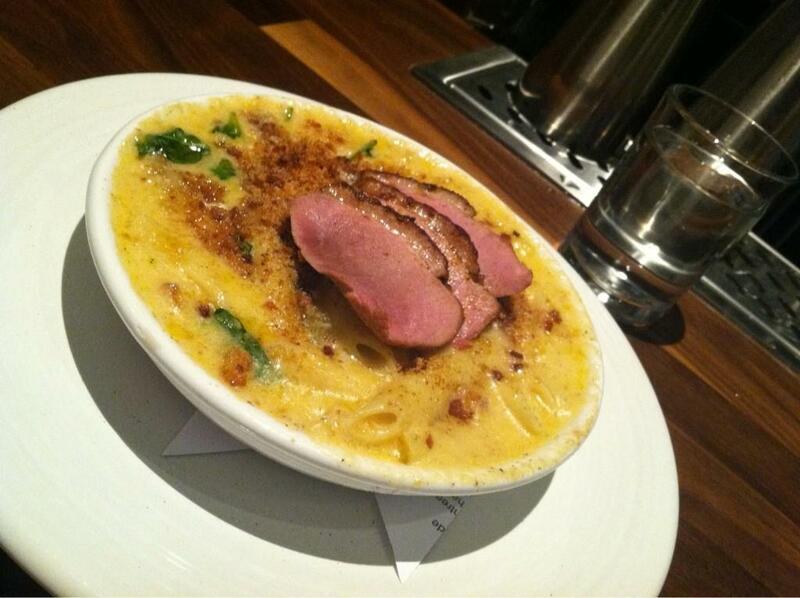 The duck and mac and cheese compliment each other well, and it's not like this is a random pairing. In that sense, the dish works on many levels. Be it duck and mac and cheese; mac and cheese and duck; duck in mack & cheese... It's like a LEGO set of mac and cheese. And duck. We like it, and you should, if nothing else, be intrigued by it. Update: @3reeka says it now has ribs on it. Ribs! Craziness! Do you recommend The $100 Mac & Cheese Challenge: Central Food? Make your voice heard!